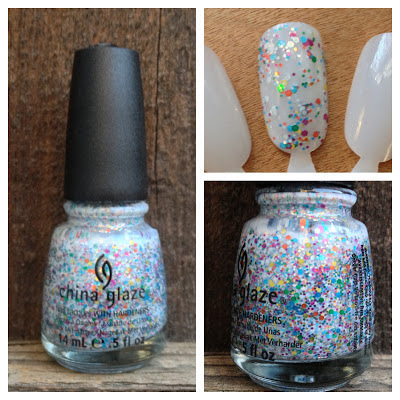 What I Blog About When I Blog About Books: NOTD: China Glaze "Re-fresh Mint" + China Glaze "It's a Trap-eze!" NOTD: China Glaze "Re-fresh Mint" + China Glaze "It's a Trap-eze!" For today's notd I will be combining China Glaze's "Re-fresh Mint" with China Glaze's "It's a Trap-eze!" for a fun Spring manicure. For the base I used China Glaze "Re-fresh Mint," a true mint green. From the photos below, you almost have to squint to tell that I used a mint green as a base. That's partially because "Re-fresh Mint" is a fairly light, non-bright mint. But also partially because the base in "It's a Trap-eze!" is not clear, but rather a milky bluish/white base. I didn't actually care too much for purchasing "It's a Trap-eze!" when it came out (one of those polishes that is fun to look at, but wearable enough to warrant purchasing). But when I went to the beauty supply store, the woman there (who has familiarized my face with the love for polish) got the polish out specifically because she knew I'd love the crazy glitter. And I couldn't help myself! It really is adorable! And now that Spring is here, I can see myself using this polish a lot more! "It's a Trap-eze!" is such a fun glitter to use. Very, very dense. Sometimes you do have to move the brush around quite a bit in order to disperse the glitter and have it not so concentrated on one area, but that is easy. Furthermore, I love that the base isn't clear. The milky base gives the affect that you are doing a glitter sandwich manicure even though you're not! (If you have no idea what a glitter sandwich manicure is, you should check out my first attempt here). I think this combination is so fun for Spring. Expect more combinations with "It's a Trap-eze!" in the future! NOTD: OPI "Tickle My France-y"
Polish Comparison: OPI "Tickle My France-y," Essie "Lady Like," China Glaze "Dress Me Up"
NOTD: Essie "Nice Is Nice"
NOTD: Essie "In the Cab-ana"
NOTD: Essie "A Crewed Interest"
NOTD: OPI "Metallic 4 Life"
NOTD: China Glaze "Glittering Garland"
NOTD: China Glaze "Fast Track"